For me, researching information for a story is part of the fun of fiction. I enjoy looking for trivia, love trawling through travelers’ Flickr photostreams conjured up by Google, and revel in learning new stuff. As well as enjoying the research, I feel that I can’t compose a story without a concrete place where my story people can eat, work and fight, so that needs strong development. 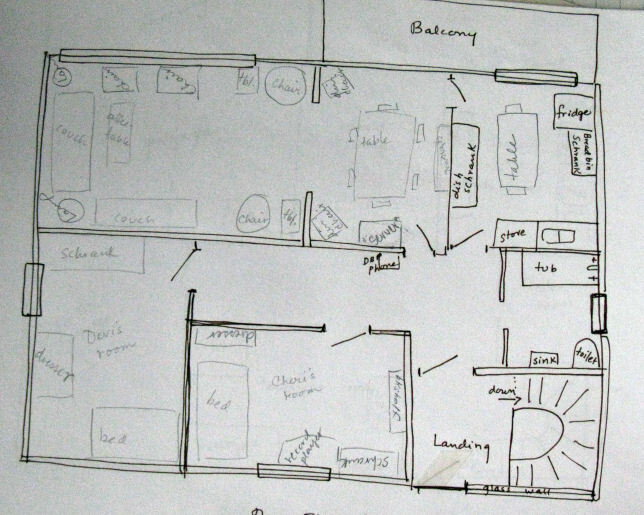 If I don’t have a solid setting, the people in my story move in a fog, and (if I use real places) I need to see what’s there; for fake places, it’s floor-plans. I need to see a space, otherwise I can’t get the characters from point A to point B. The difficulty for me in making a place ‘real enough’ is stopping the research before I decorate the setting down to the doilies and usurp the contribution of the reader’s imagination. Aunt Margaret stepped into the room and the wooden stacked heels of her shoes clicked in exclamation points while the starched folds of her skirt whispered against the mahogany trim around the door. Aunt Margaret, never Auntie Marge, Peggy or Mags, paused inside the doorway and allowed her hand to descend to the oval Chippendale end table next to the settee. She adjusted the ecru pearl cotton doily, thick with the bobbles of cobalt triple-crochets that guarded the burnished wood of the table from the porcelain foot of the blue and white vase, her grandmother’s and my great-grandmother’s vase, a translucent bubble that served as the painted and glazed jousting arena for a flight of dragons. I hadn’t touched the table, the vase, nor any other ornament in the room. I felt guilty for having perched on the edge of the settee without first asking, but after twenty minutes of waiting I figured I was safer sitting than strolling aimlessly among the treasures. Aunt Margaret picked up two rose petals, fallen from the rounded and mounded hothouse blossoms shading the crouching dragons, and placed the cerise petals in her palm. She stared at them for a moment, then turned her gaze on me, the kind of gaze an owl might give a mouse. She never enjoyed my company, so why had she asked me here today? I’d better stop there before it all turns purple. Even for that orphan scene-without-a-story I looked up Chippendale end tables to make sure that Chippendale did build end tables, as well as feeling the need to look up the collective noun that signifies a group of dragons. I learned something about furniture and the naming of dragons, but I feel that during the creative phase of fiction I ought to be braver about just making up things. Of course, I know better than to talk about a Chippendale stereo-stand, but maybe a flame of dragons would work as well as a flight? After all, nowadays I’m not even spending ink and paper on composition, and everything can be erased, so why worry? (perfectionism is most likely the fault) For me, knowing the details are correct the first time relieves some of the stress of wondering if I’ll catch the inaccuracies while proofreading, but Googling details in the middle of a sentence does cut in on the dance of the dream. I’m guessing that the balance between accuracy and productivity is deciding that you have ‘enough,’ as well as not wandering off in yet another interesting direction — wandering off has killed more hours than I care to think about. After all, ‘it’ is just a story, not a furniture assembly kit, or a recipe, or a clothing pattern, never mind a process that is exponentially more complex than household activities and could cause harm if it were poorly done. It is unlikely that an inaccurate setting in a story will cause problems in the real world, witness all the inaccuracies I’ve seen in stories, written or acted, that continue to be popular. No one will fall down and hurt themselves, be poisoned, or have a trousers seat rip in public because I put crunching gravel in a fictional parking lot that, in the geographic place, is paved with blacktop. I have now confessed to a poor creative habit, and have (in my mind) obtained absolution through the penance of taking the time to examine my conscience (work habits) and doing a good work by adding an entry to the neglected blog.